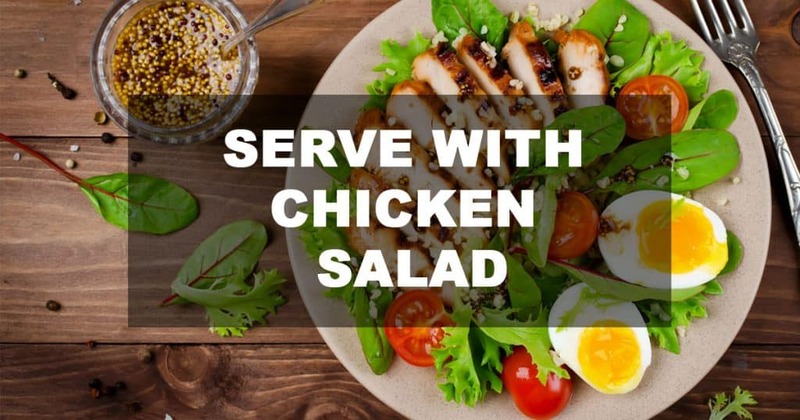 Chicken salad basically consists of salad which has chicken in it; this means that you have a wide array of salads to choose from when making a chicken salad, yay! Although this is good news don’t forget that you also have to consider palatability because believe it or not, some salads might not just taste right with chicken in it and then the type of chicken you use also plays a determinant factor. There are ways to make chicken salad that puts the chicken at the “centre stage” so to speak amongst the other ingredients because just as there are many ingredients to use, there are some that should be used in lower proportions than others. So let’s see some recipes you can play with for the perfect chicken salad and pairs for them too. The beauty of making a chicken salad is that you can make it as rich as you want with a selection of perfectly combinable vegetables and this recipe by Simply Whisked is a typical example of fine vegetable fusion. The inclusion of cilantro in the salad gives the dish a little-heightened taste, and I do know it’s not always a spice welcomed with open arms so using it in little quantity should be best depending on who you are serving especially if it’s meant for a gathering. So tortilla chips in salad…hmmm, of course! 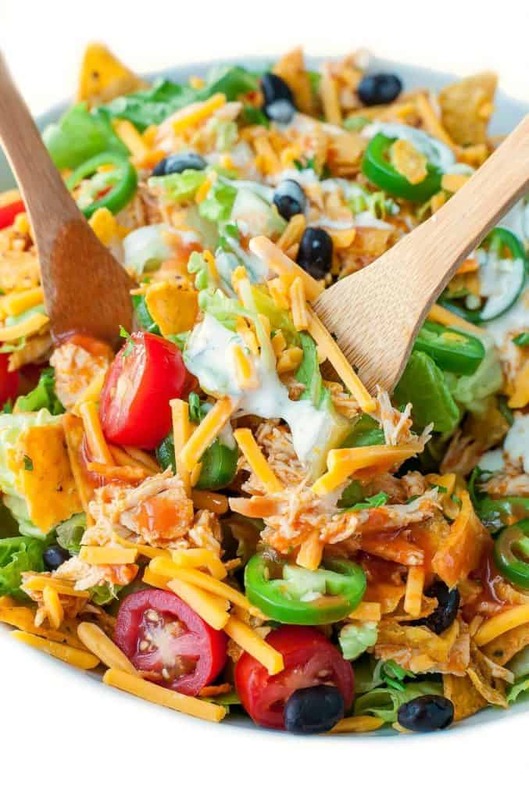 Use this recipe by Peas And Crayons for a top notch buffalo chicken taco salad that you will enjoy. The combination of the tacos with the other vegetables gives a colour burst that makes you want to eat heartily, and that’s a good sign for any salad. This recipe also made use of a hot spice, and if you do not have the Frank Red’s hot you can use any other store bought or home made one you have, the importance is in the flavour and the amount of heated up spiciness you want in your food at the end of the day. For this recipe, any kind of chicken goes be it leftovers or freshly made! This is another chicken salad recipe that uses ingredients that are not only low in fat but are a bit different from the usual, what am I talking about exactly? Culantro! Not an everyday ingredient you stuck up in your shelves and not the same as cilantro but definitely a useful herb that has its own flavour and benefits. The use of avocado instead of mayo in this Mexican chicken salad by Abbey’s Kitchen makes this salad you can try any time of the day. The serving pattern of the salad in the avocado backs is also very innovative, perfect for a party or get together with friends and family. You can serve your chicken salad with some brown rice and depending on how your salad is; you can choose a very well garnished brown rice or a lightly made one. For the context of today’s discussion, let’s go for a lightly papered simple brown rice with this recipe by The Honor System. Usually, the most encountered problem with cooking brown rice is the gummy-ness which could also result in the rice getting burnt. Don’t get me wrong, I have seen some recipes that use the gummy rice to their advantage and make a swell dish out of it but not this one, so if you don’t want all that starch gum, this recipe is more than perfect. If you follow the very simple instructions, what you get is a tastily cooked brown rice that is perfect for chicken salad. Serving your chicken salad with bread is another nice way to pair it and rather than buying some, take it upon yourself to make some sourdough bread with this recipe by Lively Table. Making bread from scratch always seems like so much work especially if you are one that’s not always up for baking but you know what? It’s good to pull a surprise to yourself every once in a while. Thankfully, the recipe comes with a picture explanation of how to go about it from mixing with the starter all the way down to the final baking. To go cool with a fruity side, try some roasted beets, yes you could boil your beets but mehnn! Roasting gives it a heightened sweetness that you didn’t know beets could have, try this recipe by Happy Healthy Mama for some roasted beets. If you are up for herbs and seasoning, sprinkle some dried thyme and pepper, this will come out in the aroma and flavour of the beets when you are all done. For all the mayo and cream you put in a chicken salad, simple vegetables as side dishes are always best except you want to go heavy or have an overly desire to eat or serve something more filling. When making a chicken salad, work with taste, what you feel wouldn’t taste right together with your chicken just might not taste right! So you should be a better judge of what combinations will make for a perfect chicken salad. That being said, there is an impressive selection of chicken salad recipes packed in this cookbook by Laura Sommers, about 53 of them! With this, you can’t run out of ideas.